Our three (and almost half) year old has been exploding with words these days. From the minute he wakes up at 6am until he goes down at 8:30pm, he is spewing with words (with a mini break for a nap in between). New words, old words, made up words, repeated words, he has them all. In the car, he bombards us with questions from destination A to destination B and has a running commentary on every house, car, person, dog, cloud, and blimp we pass. The other week, we passed acres and acres of almond groves and grape vines as we drove from our friends' house in South Lake Tahoe to visit some other friends in Montecito. T spotted a field of trees, their branches elegantly arched like outstretched limbs, blooming with wisps of delicate white, feathery flowers. 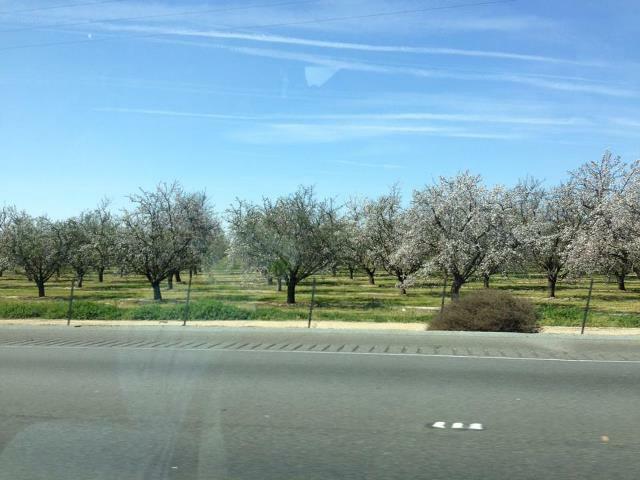 When he saw them, he exclaimed, "Look, Mommy, those trees look like ballerinas!" Sugar Plum Fairies, anyone? Such poetry from my little man. When he talks, Jeff and I do all we can to listen (well, most of the time). We lean toward him, we crane our necks, we bend at our knees. We parrot back his words to show we understand. We answer all of his questions, even after the eighteenth "why", even after he circuits back to the same question he asked three questions earlier. We nod our affirmations or explain why we disagree. We open our faces with surprise or scrunch them with consternation. We do all we can to continue the dialogue. Sometimes, however, his precious words come out a little muddled. It could be that the word is a tad too big, and all the vowels and consonants get jumbled and squashed in his tiny mouth. Or in their hurry to land in our ears, the words run into each other, one unsuspecting fragile mound of syllables tripped and overrun by a bully on its heels. Or little T forgets to breathe in the middle of his rushed sentence, and all the words abandon their beginnings and endings and leave us stranded in an incoherent blob of sounds. The latest has been T's insistence that his words can sound the way he damn pleases, and if he wants to pronounce "cat" as "chat", that's his prerogative. What three (and almost half) year old has not had a mispronunciation or two. Or some jumbling or slurring of words. Maybe even a lisp. It comes with the territory. We understand that. But what we did not expect was the explosion that happens after we fail to take in what he has to say. If we misinterpret what he has said, he unexpectedly becomes silent. Then, his little lips start to tremble. Little mounds of tear well up in the corners of his eyes. Then the bawling starts. In between the slobbering and the hyperventilating, he shouts, "You MIZ-understood ME!" It's as if we told him that he could never play with Buzz Lightyear ever again. Or that Mickey died. Or that he could no longer sleep in his Lightning McQueen bed. It's as profound an upset as he could experience in his three and half years of existence lived with a belief in Santa, an unquestioned expectation that food would appear whenever he hungered, and the unwavering knowledge that he could get his star as long as he peed and pooped in his potty. When his tears start to fall, we entreat him to repeat himself. "Help Mommy and Daddy understand what you said. Can you say it again?" We give him our most concerned smile, attempting to convey that fortitude is what is required at the moment, that we are ever so eager to understand. Sometimes, he shouts back with a big "NO!" and continues to cry. But after some cajoling, he repeats himself -- and sometimes (reluctantly) again -- until we understand. "Oh! Is that what you said. Now we understand! What a good thing you repeated yourself. And you know, I don't know if blimps have steering wheels. Do you want to look it up when we go home? What a good question!" I've been thinking about his need to be heard and to be understood. To not be misunderstood. And I think about my own experience growing up in this country. Where I often felt as if no one understood what I was going through. That words were often inadequate to convey my perspective, my experience. That even if I spoke, not many could really understand because they had a different frame of reference. How I often chose to stay silent because it seemed so pointless. And I wonder how it impacts us. What do we do with this apparently deep seeded need to be understood when no one does? Where do all those upsets and tears go when those we want to make understand cannot? I would like my children to have their crying fits now, when we can identify the source of their frustration, rather than later when it takes five therapists to untangle the causes. I want them to have the faith to know that we try, that we'll always try to understand, even if we misunderstand each other at times. I want them to keep trying talking to us, even we seem to lack the ability to understand, even if we at times may be too busy to hear. I want to instill that fortitude in them, the fortitude to keep trying, because if we give up on words, we can so easily lose each other. And losing them is not something I -- no parent -- can stand to bear.